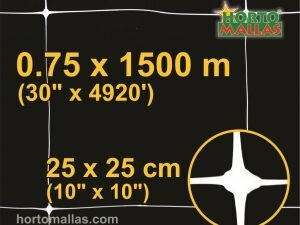 Here a comparison between raffia twine and HORTOMALLAS trellis net; which one would you use in your field? 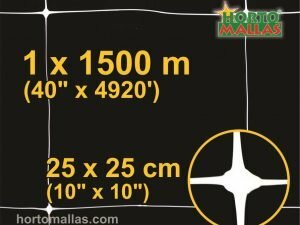 HORTOMALLAS trellis net can be used many cycles of crops, even left out on its post supports, amortizing the mulch and irrigation expense over a larger number of harvests, rotating cultivations in an phyto-efficient manner. 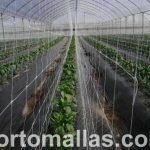 HORTOMALLAS trellising net can be easily installed 30-50 cms above the soil in the furrow, to take advantage of the plant´s capacity (in the case of climbers with tendrils like cucumbers and beans) to find its way upwards towards the first mesh of the net and not have to spend extra money to cover a larger surface. 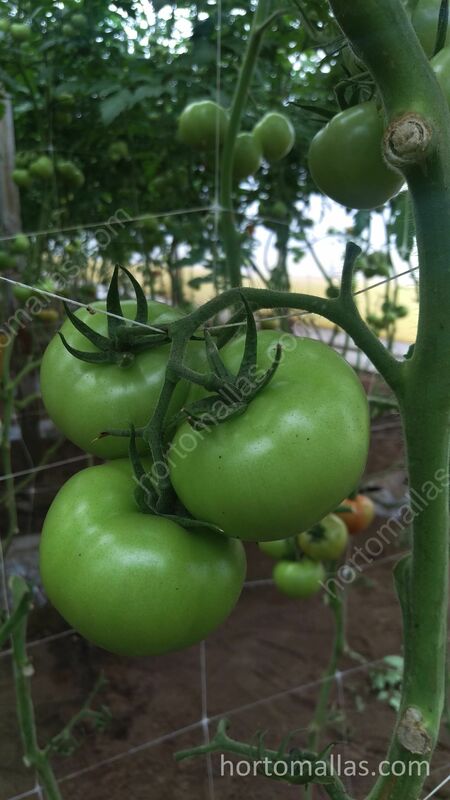 As one can appreciate from the picture, the plant support netting can stay installed even after the first cultivation cycle, alternating crops, whether they need or not a tutoring system. 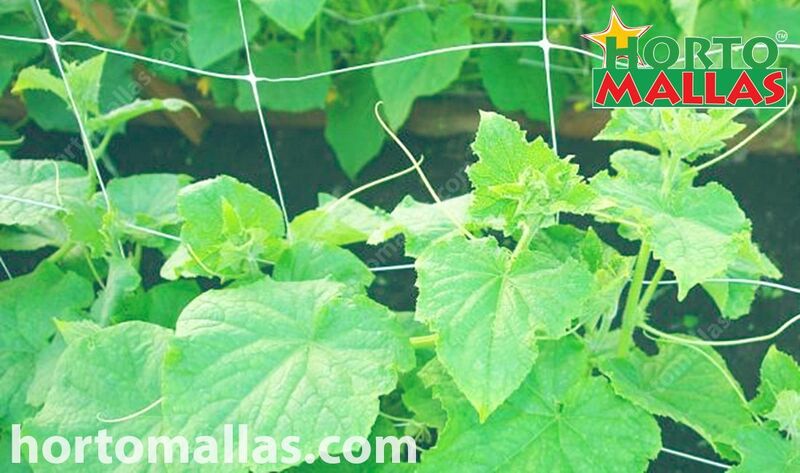 In the case of peppers, eggplants or tomatoes, we recommend using a double wall system, installed lower, as to allow the first line of trellis netting mesh near the ground on each side of the plant to be tied in order to hold the plant upright. 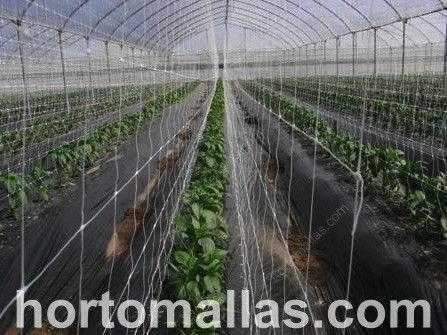 Many varieties of bell peppers can be grown using this type of netting as a support, even inside greenhouses. 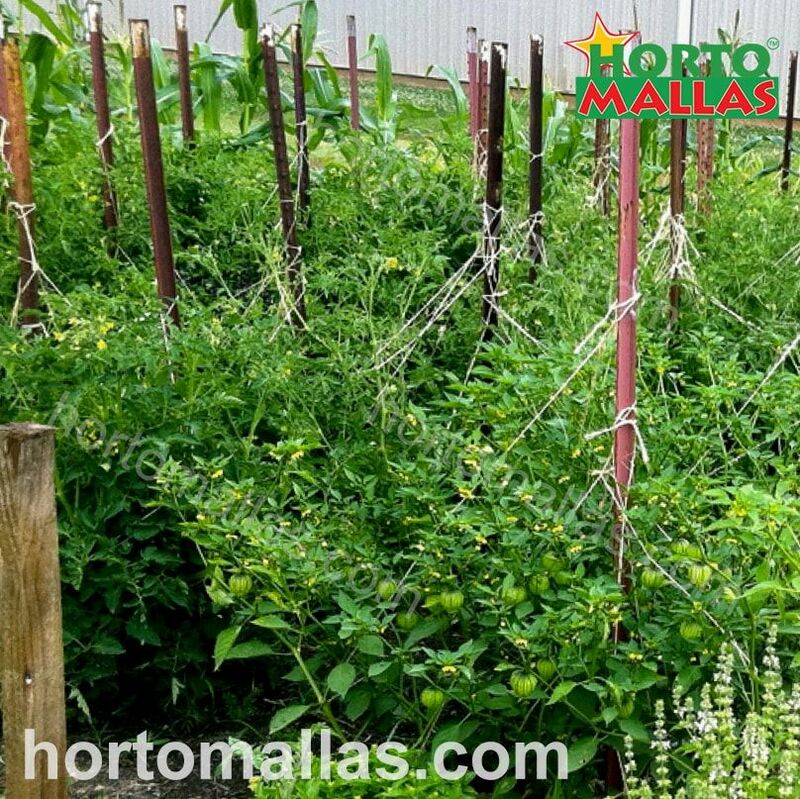 Among the many plant tutoring and trellising options, HORTOMALLAS trellising nets are the most cost effective, as it is easily installed in just a fraction of the time required to weave raffia twine into a usable espalier. 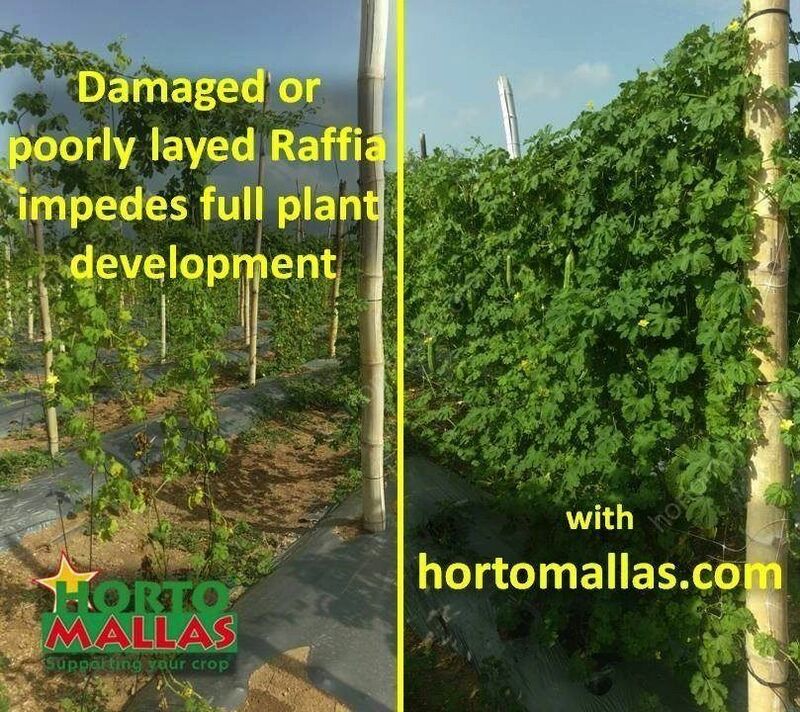 Once you factor in the fact that ir can be reused many for many crop cycles, HORTOMALLAS trellis net definitely tilts the scale towards this modern and innovative way to train and tutor vegetable plants. 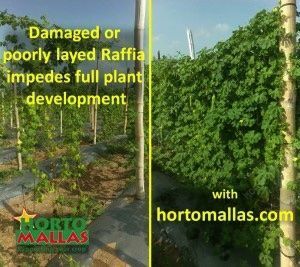 Used in Europe since the early 70s, HORTOMALLAS trellis net will reduce the rate of propagation of diseases and phytopathogens since it also requires less labor and human intervention during the tutoring phase, less hand contact less vectors! See the advantage of training vegetable plants. 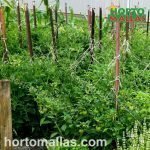 One will notice that using HORTOMALLAS improves not only yields as the plant can concentrate on adding weight to the fruits rather than recouping from the stress of manual training, as it happens when using raffia string. Tutoring plants on a wire entails a labor heavy operation of guiding the plant stock upwards and sometimes even fastening it to the raffia with a HORTOCLIP or a tie. Every time we handle the plant manually we stress it, as we change the natural orientation of its leaves. We all understand that plants are efficient organisms, so they tend to lay their foliar system in such a way as to capture the most amount of sunlight. Plants respond to this type of mechanical stress by halting fruit production and utilizing their resources to rearrange the leaves. We normally lose between 8 and 10% in terms of weight due to handling plants excessively. 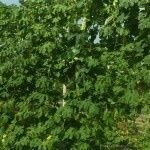 Reasons for reducing mechanically transmitted diseases by changing trellising systems to netting. 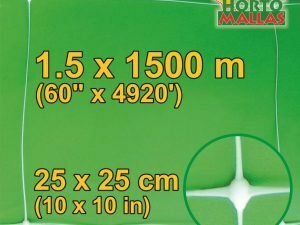 Using HORTOMALLAS will allow for a passive system of tutoring. 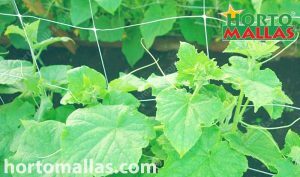 Branches will lean naturally on the horizontal strands of the trellising net, or in the case of climbers like cucumbers, their tendrils will attach themselves to the net, avoiding any need to touch the plant. By reducing the exposure to the touch or friction of workers who may be unknowing carriers of pathogens in their clothes or hands, one is able to control phyto sanitary conditions a lot better than trying to control the septicity of employees who might be carriers of TMV after a quick smoke of a cigarette!